I will be teaching two classes at Star's Beads in Vienna, Virginia in April. One of them, Moons of Saturn, is new. Here is the basic info. If you have any questions, email me. If you wish to register, call Star's at 703 938 7018. BANGLES: Friday, April 11, 10-4pm; $60. A fun and full day of learning wire working skills. We will make 2 or 3 bangles in copper, brass and Sterling Silver. 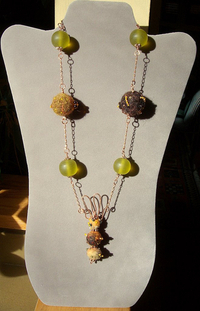 Learn to coil, wrap and form metal, to make focal and accent beads and fun dangles that are heart and triangle shaped. We'll clean and polish the metals and then learn to antique them. We'll also make a beaded focal bead. MOONS OF SATURN, Friday, April 24, 10-4pm; $60. I have been having loads of fun making needle felted beads and shapes and then embellishing them with seed beads. In this class we will make felted balls about an inch in diameter and then sew small complementary-colored seed beads on them. 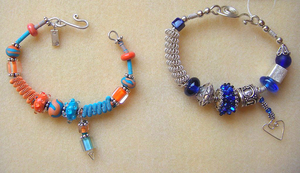 You can make tubular shaped beads, or even a little "Devil" as I've done in photo at right. In addition we'll learn some interesting new wire working shapes to complete a unique necklace.